The Balinese is an active and busy cat that likes a 'chat' and is more than happy to follow its owner around lavishing affection on them as they go! This long-haired cat is part of the Oriental family and was developed from the long-coated breeds that were found in Siamese litters throughout the USA. Its elegant shape and movement was the inspiration for its name as it reminded breeders of the native dancers on the island of Bali. 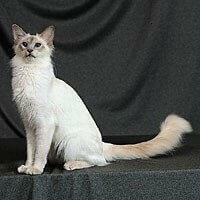 A medium-sized cat, the Balinese conforms to the svelte shape of the Siamese. However, overlaying its slim body is its semi-long silky coat which, despite its length, does not require as much grooming as those of other long-haired breeds. In fact this beautiful coat and its gorgeous, long plumed tail are almost the only things that distinguish it from the Siamese. Its almond-shaped eyes are blue and acceptable point colours are blue, lilac, seal and chocolate. For those people who want to own a cat that is on the ball, the Balinese is an active, playful, and devoted companion with elegant good looks and likes nothing better than a cuddle or to sit on its owners lap.